At last! After months of laughing and giggling on our own we can finally present you the funniest RPG of the year! The Chronicles of Nyanya will blow your mind with adult themes hidden behind bright cartoon graphics of... cute kitty cats, mostly. As you progress through the game’s story, you can try to pull Catair away from the darkness... or not. There’s a friendship system running under the game’s hood. It changes the gameplay and the story according to the choices you’ve made on numerous occasions. 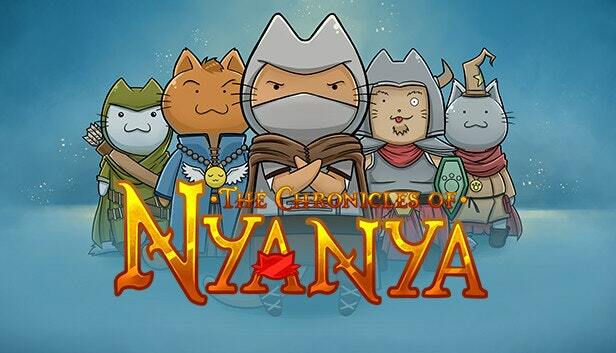 You’ll have to play The Chronicles of Nyanya multiple times to discover every corner of the story. Oh, the story! It’s huge! The Chronicles of Nyanya’s script is over 113 000 words long - that’s more than The Hobbit (95 000 words). Moreover, the dialogues and other texts are packed with comedy; full of hilarious meme jokes, ironic comments and fun pop culture references. The more movies and TV series you’ve watched, novels and comic books you’ve read, or games you’ve played – the more fun you’ll have! The Chronicles of Nyanya is available from February 16th, 2018. You can buy it on Steam or Nuuvem. If you are in a charitable mood please find the game on Humble Store. If you want to review the game, please apply for the key here: press@fatdoggames.com . One-of-a-kind world: a mix of cute pixel art, adult themes and wonderful weirdness!